The next time you’re in a public place — a coffeehouse, a park, a store — observe the people around you. Pick a person, a couple, or a group, and imagine what their lives might be like. I went to Mass this morning to my parish which is a beautiful gothic church part of the St. James Way (in Spanish Camino de Santiago), a pilgrimage route since the medieval ages still active today that goes from different points of Europe to Santiago de Compostela in Galicia, Spain, were the remains of St. James are. Just behind me there were a young couple with backpacks. They attended the Mass and then stay to visit the church. They were speaking german. I imagine them in Germany or Austria a year ago making plans to do the Way. You need extra vacations to have enough time to do it from there. It would take one, even two or three months walking the routes millions of pilgrims from many countries throughout many centuries traveled before them. So is not something decided in a rush, but carefully planned in advance. Have the free time arranged, all the necessary information collected (route maps, equipment) and get trained. They probably didn’t know each other at the time they were making plans. As so many others they sure met along the way. A first encounter by chance, and then another coincidence in some shelter at the end of a long day… Maybe then they decided to walk together and now they are good friends. Many people start the way because of pure cultural or recreational reasons, but this two had found also religious motivation. Walking on the same way so many pilgrims walked for centuries looking for spiritual health, seeing some of the buildings they saw, crossing the bridges they crossed, praying in the same churches they prayed, make you think about the deep roots of your faith if you have it. They sure entered Spain through Ibañeta and Roncesvalles in the Pyrenees. 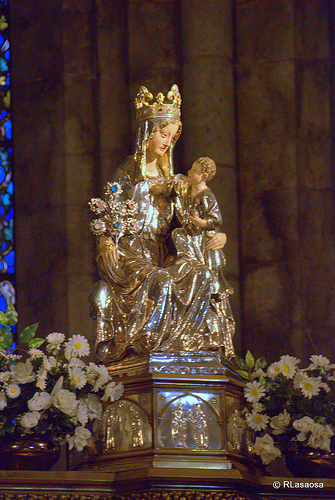 The collegiate church dedicated to the Virgin Mary of Roncesvalles is the first place to have a rest after crossing the French Pyrenees for the pilgrims. The church has a beautiful medieval statue I like to visit every year and you can see in the picture by Rufino Lasaosa. Every year thousands of pilgrims begin their way to Santiago de Compostela at Roncesvalles and they arrive two or three days after to Pamplona, to continue towards Puente la Reina and Estella, so the city experiences a constant flow of pilgrims. Our two german pilgrims are sure staying in the shelter next door to the church and maybe spending a day in Pamplona to rest a little and see the city before continue their way to Santiago. They have at least three weeks ahead from shelter to shelter before they’ll arrive to the Monte del Gozo from where they will see their goal: the Santiago de Compostela Cathedral. Who knows how would be their relationship by then? Daily Prompt: Imagine All the People.